Monte-Carlo Casino, an online casino site which acts as a companion to one of the world's most famous bricks and mortar venues, has relaunched with games from NetEnt and Quickfire. You will soon also be able to enjoy an even wider range of slots, table games and live dealer games with content from the likes of IGT, WMS and Amaya set to follow soon. Among the games on offer are NetEnt's Mega Fortune and Gonzo's Quest online slots, while the Cercle Club VIP program is just one feature which Betclic Everest Group and land-based casino group Société des Bains de Mer hope will tie together the land-based and online versions of the iconic casino. 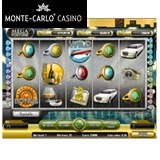 Licensed in the UK and Malta, montecarlocasino.com brings all the prestige of a world-renowned casino - featured in movies such as Oceans Twelve and Casino Royale - to the online casino world.